Gagik Harutyunyan was born on March 23, 1948 in Armenia. 1970 - graduated from the faculty of Economics of the Yerevan State University with honour, thereafter was a post-graduate student in the Yerevan State University. 1973 - was a lecturer in the Yerevan State University, then was the chief lecturer, Docent in the Institute of National Economics. 1982-1987 - was an economist-lecturer in the Central Committee of Communist Party of the Armenian Republic. 1987 - was appointed as a head of the Social-Economic Department of the Central Committee. 1990 - was elected as a Deputy of Supreme Council of the Republic of Armenia, in the same year was elected as a Vice-Chairman of the Supreme Council of the Republic of Armenia. 1991 - was elected as a Vice-President of the Republic of Armenia. 1996-2009 - President of the Center of Constitutional Law of the Republic of Armenia. Since 1997 /October/ - the President of the permanent acting Conference of Constitutional Control Organs of the Countries of New Democracy and the President of the Editorial Board of International Bulletin "Constitutional Justice". Since 1997 - the member of the European Commission (Venice Commission) "Democracy through Law" of the Council of Europe. Since 2009 - the member of the Bureau of the World Conference on Constitutional Justice. 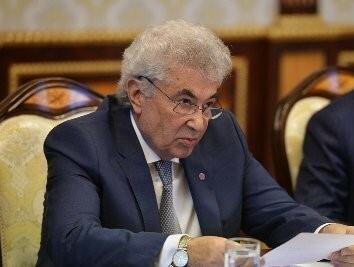 Author of more than 200 scientific works and 23 monographs (in Armenian, Russian, English and French) dedicated on the basic issues of Regional Development, State Governing, Democratization of Society, Constitutional Law and Constitutional Justice. Participated and made presentations at more than 50 international scientific and practical conferences on issues dedicated to Constitutional Law, and especially to Constitutional Justice.